Wintergirls is the kind of novel that, when you turn the last page, you just sit there thinking. And thinking. And thinking. This novel deals with girls being ashamed of their image and how they look, and the lengths they will go to change themselves. The things that a person will do to make themselves “thin” or “pretty” can be fatal if it goes too far, as Lia herself learns. BUT, while this novel deals with those problems, it’s not about them. Anorexia and bulimia were not the disease, only the symptoms. When people describe this book, they often say “Lia suffered from anorexia.” No, she didn’t. She suffered from a crappy life, she suffered from her own fears and insecurities. Lia suffered from herself. Anorexia and cutting were how she escaped. I’m not saying those are right by any means, but this novel isn’t about that. It’s really about coming to terms with yourself, and learning to accept who you are is who you will always be. There are just some things you can never change, and some things you’re not supposed to change. This novel, for me, was scary as hell, but completely amazing. It delved right into Lia’s mind, into her problems. It really made me think about myself and all of my insecurities, and it helped me accept some things. Anderson writes with such stark, vivid, dark tones that there were some parts where I had chills running through me. I read this book in one sitting because I just couldn’t stop reading. I absolutely recommend this book to teenage girls, especially those that have doubt about themselves or who they are. 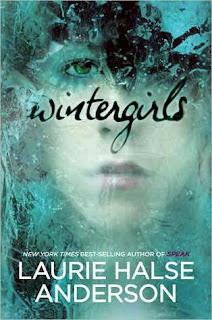 Add Wintergirls on Goodreads and Shelfari. I know it's stupid to write a comment that just says "great review!" But, that was a great review. I've read this book, and I think you evaluated it perfectly. I always encourage teen girls to read this one. I loved this book, I was kind of scared to read it at first because books that deal with such dark issues kind of scare me sometimes, but I was glad that I read it. I love LHA - get her other stuff if you haven't already!! This sounds awesome, I must read it! I just posted my review for this one yesterday and I'm so happy to come across your review to compare thoughts. I totally agree with what you mention, about what the book is really about. Awesome review. Thanks for sharing. I just ordered this after reading your review. I've only read Speak from this author so far but that is one of my favourite books from being a teenager. Look forward to reading it. This book has been on my to-read list forever! I really love the way you described it, it makes me want to read it even more. Anorexia is rarely the real problem, and of course Laurie Halse Anderson would be the one to see that. =) Thanks for the review!